Increasingly cool weather was forecast for the beginning of the week. Record lows were possible, with freeze warnings in the Rogue and Klamath valleys. Smoke from the Biscuit fire straddling the California-Oregon border had closed Highway 199 and threatened the evacuation of the Illinois River valley. Cave Junction, O'Brien, and Selma was reportedly under siege. So when we left Blue Lake on Sunday around noon, we were in no big hurry to go backpacking. In fact, we weren't sure where we were going at all. A light drizzle fell as we gassed up, and it sprinkled on and off on our way east along Highway 299. Sun-yellowed smoke thickened as we drove from Willow Creek to Weaverville. 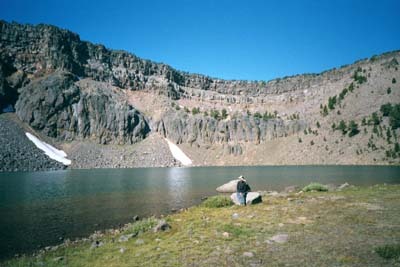 Our first choice of Wright Lakes in the northeast corner of the Marble Mountains began to look like a bad idea. Instead we continued east through Redding, enjoying the unseasonably cool weather, then circled north to our cabin in the Southern Oregon Cascades, where we hunkered down and waited. The temperature got down to the upper thirties at night. On Tuesday morning smoke obscured the trees across the lake. But the weather radio promised a warming trend later in the week. So we resolved to head east, away from the smoke, to the South Warner Wilderness. The smoke thinned as we progressed east. At the Modoc National Forest Ranger Station in Alturas we stopped and sought counsel. None of the young rangerettes could think of a single reason why we wouldn't have a fine time hiking up the Pine Creek Trail to Patterson Lake. No, none of them had ever hiked up there, but lots of folks do it. So we took directions and headed for the Soup Springs Campground at 6800 feet. As we entered the Jess Valley from the town of Likely, the massive shoulder of Eagle Peak hid from us behind the smokey haze. The actual spring at Soup Springs was protected from thirsty cattle by a pyramid wooden rail fence, as was the rest of the campground. Only two other parties were camped there, a group with two horse trailers and a couple who hovered about their open minivan as if perpetually departing. After dinner we walked up the Slide Creek trail a mile or so and saw at last the outline of distant Eagle Peak through the haze. Overall, the smoke was much diminished. The weather was cool and windy, and the temperature got down to 37 degrees that night. Early Wednesday morning a short drive north on the West Warner Road took us to the Pine Creek trailhead. We slathered on sunscreen, buckled on our packs, and began the hike. The first part of the trail followed Pine Creek through a tall shady fir forest and past several small ponds cut into the moraine by the creek's babbling waters. 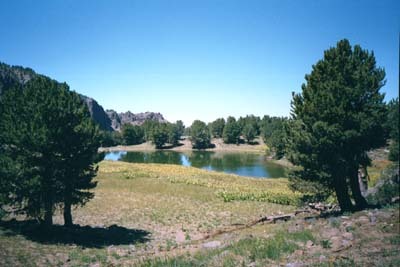 A spur trail cut down to one deep and attractive pond in the forest with a dandy campsite. On the trail we stood aside for a lone horseman riding out. He sported a magnificent handlebar moustache. We asked about potential campsites beyond the meadow ahead. He had seen no campsites, but assured us we could camp well at one of several wooded areas above the meadow where streams trickled through. After an hour or so we encountered a young man, who introduced himself as Jessie, and two teenage girls, one toting a black backpack and the other riding Jessie piggy-back. Miss piggy-back had sprained a tendon in her ankle and was being carried back to the parking lot for extraction. Jessie, we learned, was a youth group leader from Mountain Meadow Ranch in Susanville. He was shepherding a dozen teenagers for a two-nighter at Patterson Lake. Jessie entrusted us with a message for Max waiting with the others at the meadow ahead. We pressed on to the meadow and found a group of teens jabbering loudly in the shade, waiting for Jessie to return and lead them onward to salvation, or at least to something more interesting. Barbara passed along Jessie's message. The constant chatter was an offense to the wilderness, especially in the face of the spectacular vista of Pine Creek Basin which had opened as we emerged from the woods. The teens seemed not to notice at all. We decided to hike a bit further for lunch to spare ourselves the mindless prattle. One of the group was helpful in showing us the proper trail cutting north through the meadow. After lunch we hiked up the trail trying to locate one of the potential campsites that Mr. Mustache had boasted about. 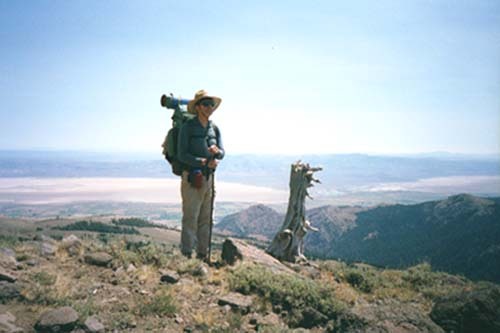 We climbed above the fir forest and into the broad sage-covered slopes of the Pine Creek Basin, spangled with patches of flowering Mule Ears and Corn Lilies already well past their prime. Here and there groves of aspen and whitebark pine and a decreasing number of Douglas fir peppered the sage-green landscape above us, but we could not be certain where a streams ran or a spring might bring water to the surface. We encountered a young couple hiking down from Patterson Lake with a tale of woe. They said hordes of people and horses infested the lake, and that the night before thick ice had formed on their dog's water bowl. They had arrived at the lake late, prepared their dinner in a strong cold gale, and endured the night in an inadequate campsite in a small meadow beside the lake. They were hiking back down to the Pine Creek meadow for the night. With this news we reconsidered our options. It was already past two in the afternoon, and we had nearly eighteen-hundred feet of vertical gain yet to climb. If we went too far, there would be no more water until the lake, and we would be arriving there in an abyss of low blood sugar. We explored a small grove of fir trees near a small steam we had just crossed and decided to make a campsite there. I built a rock ring for the campfire and we scraped out a reasonably level tent site from the duff and dried cow pies. Late in the afternoon Jessie and his charges straggled past under heavy backpacks. They did not see us reclining in our hammocks in the shade of the nearby grove. Their eyes were on the steep trail, their chatter silenced at last by the upward toil. That evening was pleasant. We sat in the fragrant sage with lupine between our legs transfixed by the spectacular view of the Pine Creek Basin. It was a geologist's dreamscape. Imagine a brick. A large brick. A tremendous brick, fifteen miles long, north to south, six miles wide, east to west, and five thousand feet thick. This South Warner brick began as sediment deposited at the bottom of an ocean and was levered up by the Pacific tectonic plate slowly jamming beneath it. 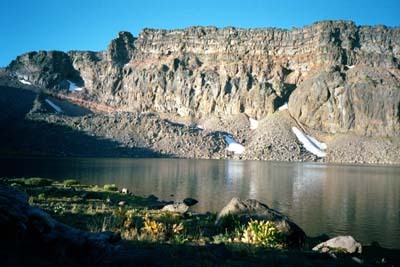 On top of the sedimentary layer fell a fifty-foot-thick layer of pyroclastic rock and pumice and ash from the exploded volcanoes to the west at Medicine Lake, Mount Tehema, and Mount Mazama, fused into a pale breccia. On top of the breccia flowed three hundred feet of basalt lava in layers like frosting on a cake. Heat and pressure transformed the sedimentary rock below into metasedimentary schists and cherts and slates. Then imagine this colossal brick being tilted, uplifted on the east to nearly ten thousand feet, so that the brick's short side drops more than five thousand feet down to the alkali sinks of the Surprise Valley below, its wide side sloping back to the west to the four thousand foot Alturas desert plain. Then imagine unmelting snows accumulating to form a glacier in the center of this brick, its grit-bearing ices slowly gouging downward into the lava crust and excavating a massive gorge over a mile and a half wide, north to south, and two miles long east to west. As the glacier receded, it deposited glacial till in a series of benches. This was the Pine Creek Basin laid out before us. We watched as orange light of the smoke-filtered sunset rose slowly from the lush green meadow below to the lava-crowned rim of the basin surrounding us like a haze-varnished mural. Thursday morning was sunny and clear. As we ate a leisurely breakfast, light from the rising sun passed through leaves of quaking aspen, dancing on the trunks and branches as if reflected from ripples on a pond. Small birds, drawn by the water, flitted about us. The smoke had cleared to reveal Mt. Shasta's snowy mantle hovering on the western horizon as we began our hike up the long moraine northeast towards the Summit Trail. We were glad for the cool weather because the trail was steep. Through the pale green sage and patches of wilted Corn Lilies we crossed and recrossed the small steam that had provided us water. At 8144 feet we passed through a potentially fine campsite in trees near a larger stream, the last water we would encounter before Patterson Lake. Fir and aspen gave way entirely to whitebark pine, standing in small groves and short solitary trees, as the trail ascended the moraine benches in long switchbacks. The silent climb was pure zazen: an endless series of vivid steps and deep breaths, signifying nothing, pushing all thought from the mind. At 8962 feet and five miles from the trailhead the Pine Creek Trail dead-ends into the Summit Trail. A scrawny pine, a patch of flowering Mule Ears, and a signpost mark the junction. The vista was awesome. Before us to the east steeply chiseled canyons fell away to the Surprise Valley and the vast Nevada desert beyond. A few green rectangles of irrigated farmland below were dwarfed by the bone white-playas and the pale gray mountain ranges marching east to the horizon. 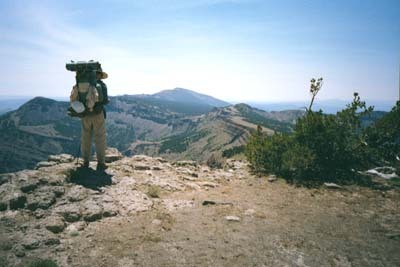 Due south the Summit Trail traced the scrubby head wall of the upper Pine Creek Basin and defined the western edge of the Great Basin. Its eastern edge lies in the Wasatch Range and the Colorado Plateau. Water running eastward down this slope would never find the ocean, but would evaporate or sink into the harsh alkali sumps of the Surprise Valley. Five miles further south rose the rounded mound of 9892-foot Eagle Peak. To the west the Modoc plateau lay out like a great table. On it sparkled the Pitt River wetlands, into which Pine Creek drained. The waters of the Pitt meander west, beyond our view, to join the McCloud and Sacramento Rivers at Shasta Lake, then flow south to merge with the San Joachin in the Delta and on to the Pacific Ocean at San Francisco Bay. Mount Shasta, shimmering on the horizon, demarcated another dividing line, separating the vast Klamath River drainage to the north from the Sacramento to the south. Abruptly to our north loomed 9710-foot Warren Peak, around whose impossibly sheer basaltic cliffs the Summit Trail would take us. We hiked north on the Summit Trail, climbing, intoxicated by the views. As we approached Warren Peak, it looked like the trail would end at a stone wall of frozen lava or else be squeezed off the cliff into the Great Basin. But the trail led us around to the east side on the narrow top of a debris field sloping steeply downward from the basalt cliffs. At last we crested a final ridge of pale breccia talus and beheld the vista north, previously concealed. The mountain crest undulated out ahead toward Squaw Peak, its nippled crest below us now, dipped down to Cedar Pass, gained momentum, then rose again unbroken by another highway for fifty miles as Oregon's rugged North Warner Mountains. Squaw Peak is the same peak toward which we had climbed the previous year on a day hike south from Pepperdine Campground. We stood at 9350 feet, a mere 350 feet below Warren Peak. Our first view of Patterson Lake was amazing. Beneath the imposing cliff of Warren Peak the water glistened a deep turquoise. 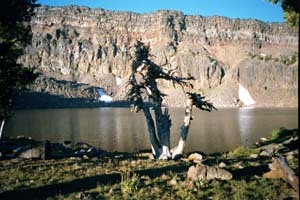 Whitebark pine, many twisted and broken in testament to the winds and lightning and harsh winter snows at 9000 feet, were the only trees in the lake's north-facing glacial cirque. The primo campsite on the terminal moraine of the lake's north shore was miraculously empty. Unfortunately, it was located directly above where the Mountain Meadow teens were camped, jabbering and preening. I had a word with Jessie, relating our long journey to Ukamon Lake, where we had encountered two troops of Boy Scouts, and extolling the virtues of teaching respectful silence in the wild, as the teens gathered round. When the point was clear, one of the girls threatened me with ukelele music. Just to make sure, I circled the north shore looking for another campsite on the rising moraine. Two ladies from Santa Rosa camped at a remote campsite further west said the teens had been very loud when they arrived the previous night. About eight o'clock one had gone down and complained, after which the noise had subsided. No other campsite was quite as fine as the one near the teens, so in the end we took it, at least in part because they had expressed their intention of leaving the next day. After setting up the tent, I spotted a flock of white pelicans high above the lake, and we watched as they circled, flashing white, almost disappearing, then flashing again, perhaps considering landing on our lake. They flew off in a mesmerizing swirl. After dinner we hiked to the meadow on the south end of the lake and chatted with the group leader, Jessie, who also works for Outback Adventures out of San Diego leading kayak trips to Baja. Later, near dusk, down from our campsite in another small meadow facing northeast, we saw an endless stream of nighthawks flying south. They seemed to be heading toward the lake. We wondered whether they had nests in the high volcanic cliffs overlooking the lake, but it was too dark to tell. Despite the ukelele, we slept well. Friday, as the teens packed up to leave, Jessie offered us some fresh trout he had caught that morning, but we declined because we had no frypan. We watched them climb along the ridge crest up to Warren Peak on their way out. After breakfast we hiked north towards Squaw Peak and had lunch on a ridgetop with great views. On the way back we tried to swim at Cottonwood Lake, but the water was too shallow. I waded further from shore, but the water never got much deeper, and I sank to my ankles in the soft muck and ooze fermenting on the bottom. When we got through splashing around, we dried off and lay on our towels in the sun. My feet itched. I gazed down. "What the hell are those things!" A dozen tiny liver-colored worms were attached to each foot. Shuddering, I began scraping them off with a fingernail. We surmised they were leeches. We examined each other, but found no more. Returning to Patterson Lake, we jumped in, and quickly out, because the deep lake was icy. On the other side of a shrub nearby, the two ladies from Santa Rosa were cannon-balling naked off a rock into the deep waters. We chatted with them for a while. The weather was pleasantly warm, and they seemed very content in the present moment. Like us, they were excited about all the bird activity. We had seen bluebirds, flickers, woodpeckers, nuthatches, Clark's nutcrackers, nighthawks, wrens, robins, juncos, pelicans, killdeer, osprey, and more. Later we hiked along the outlet stream down to a meadow, and I crossed over to the edge to view the expanse of Surprise Valley. Then we heard some loud people arriving, and they turned out to be another group of teens from the same Mountain Meadow Ranch. One black girl was looking for a spot away from the group, so I told her about the site that Jessie's group had vacated. But she was forced to stay with her group at the foot of the trail across the end of the lake from us. Saturday was definitely warmer and the birds flitted and fluttered, pecked and perched, darted and dangled all around and on top of us as we sat by the lake, enjoying a leisurely morning. Barbara was pumping water when the filter developed a leak in the plastic casing, but we managed to fill our bottles for the hike out. At the trail summit, we chatted with the teens' group leader and found out he was Jessie's Australian friend. We returned a frisbee that the other group had left behind. They were also hiking out and planned to go up to Warren Peak to leave their messages in the bottle up there. As we hiked down the trail we watched them scramble along the rocky outcroppings to reach the peak. Then we ran into a half-dozen people from McKinleyville, with two friends visiting from the Engadine Valley in Switzerland, strung out along the trail. Approaching the meadow, we stopped and chatted with a wistful Ranger who was on a twelve-mile day-hike from Pine Creek Trailhead to Pepperdine Campground. In the 70's, he informed us, he used to live in Blue Lake in the "infamous red house" with his brother. Now he lives in the Surprise Valley. He said it was smokey in the Warners the week before we got there, but the wind changed and cleared it out. He also told us that this year was the first time in 125 years that they did not allow cows to run up Pine Creek to the lake. Instead, they were putting the cows up Slide Creek. 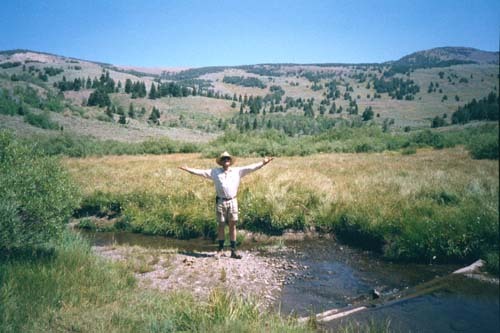 We stopped for lunch in Cedar Basin at a campsite where Pine Creek, meandering through the meadow, crossed the trail. At the parking lot we hoisted off our backpacks and repacked the van. Patterson Lake was great for no ticks, few bugs, no rain, lots of birds, white bark pines, and spectacular views. The volcanic cliffs had outcroppings with ancient ancestor-like shapes. And I had no musculoskeletal complaints for the first time since my hip surgery. 1) Ask about where the cows are running. 2) Call Mountain Meadow Ranch for their schedule. 3) Check to see if any scout groups are coming in. 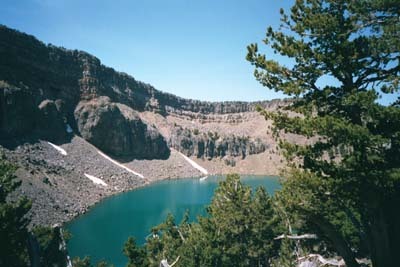 4) Plan to visit the waterfalls on Squaw Peak Trail below Patterson Lake.